There are a variety of methods you can use to deal with an infestation of bed bugs, however to be sure that they are eradicated, it is best to call a professional as they know the most efficient treatments to eradicate the bed bugs. Believe it or not, bed bugs were practically a thing of the past in the mid-90s, largely due to the fact that the insecticide used to get rid of cockroaches by hotels also killed bed bugs. That insecticide has now been banned, however, meaning that hotels do not have a consistent bed bug treatment program. This, in turn, means that anyone travelling to the hotel with bed bugs will leave them on the bed for the next unsuspecting victim. With the rise of cheap air travel, people from abroad would bring the bed bugs with them, on their clothes, and then leave them in the hotel beds. Therefore, even though it is a horrible thought, once returning from a hotel you should wash all your clothes thoroughly as bed bugs can survive in a suitcase. It only takes 35 days in some cases for a bed bug to grow from nymph to full adulthood Bed bugs can survive in upholstery, in clothes as already stated, on blankets, sheets of course, behind bedroom furniture, all sorts of cracks and crevices, mattresses, almost anywhere. They are fine in cold or hot environments, and are attracted to a warm human body as well as the carbon dioxide we breathe out. 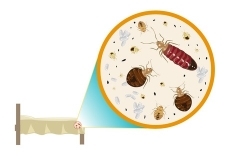 How bed bugs survive, however, is on the blood of their victims. It's not a pleasant thought, in fact it's downright creepy, but that's the way it is. They usually get to work just before dawn, but they won't wake you up because you won't feel them. The reason for that is they inject a numbing agent as they bite you so that it won't hurt you. That might sound like a nice thing to do, however once that agent wears off, the bite will be very itchy (but don't scratch it!) and it may come up as looking like a rash, or spots with pus in the middle. 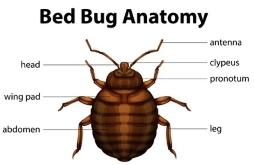 As they don't carry any diseases, however, bed bugs are not dangerous, and it is only if you scratch the bites that there is a risk of getting an infection. In any case, you certainly will want the best bed bug treatment to be rid of them as soon as possible. To be sure that infestations of bed bugs are completely destroyed, you will need a professional's help. Bed bugs breed very quickly and you have to get rid of the whole life cycle for the infestation to be annihilated, and for this you will need professional bed bug treatment. However, there are plenty of things you can do to lessen the impact of bed bugs, and reduce the chances of their returning once they are gone. The most important of these is to maintain excellent standards of cleanliness. Wash your mattress regularly, and once you have bed bugs use a steam cleaner on your mattress. This, however, will not get rid of the infestation completely nor will it guarantee that you will not get bed bugs again because, as already stated, you may become exposed to them at a hotel or someone else's residence. You can also buy bed bug treatment in the form of insecticides, although bed bugs have become resistant to certain of these and it is best to ask an expert as to which are the best to use. Also, remember that bed bugs do not just live in the bed so other areas, mostly around the bed, need to be treated as well. Anywhere there is a crack or crevice is a good bed for bed bugs. Sometimes it can be difficult to know if you actually have a bed bug problem. You might be getting bites, but unsure where they are coming from. On inspecting your covers, perhaps you do not see them. They are not, however, invisible to the human eye so you can look out for them. They are a gingery sort of colour (perhaps why people with that hair colour get such abuse!) and are about four or five millimetres long. Since they also tend to hide quite a bit, however, another tell-tale sign is if you can see little spots of blood on the covers. If you can spot one, or if you know for sure that you have a problem, then at least you can organise getting some bed bug treatment, and end the nightmare as soon as possible!